Long in the works, AT&T finally introduced its new shared-data plans today, giving customers the option to share a bucket of data among up to 10 devices on one account. The Mobile Share plans will launch in late August and will provide unlimited voice and text messages. The carrier’s move follows Verizon’s shift to shared-data plans, which launched back in June. But before AT&T customers start worrying about having to change plans, there are a couple of important things to remember. First, the Mobile Share plans are completely optional. Unlike Verizon, AT&T will not require new or existing customers to sign up for one of the new plans. Second, if you were grandfathered in with unlimited-data plan, AT&T will continue to honor it. So, if the plans are optional, who are they good for? And how do they compare to Verizon’s? In general, the shared-data plans can potentially save money for families, but they’re not the best option for individuals. The answer to the second question is a bit complicated. AT&T’s Mobile Share plans begin with one gigabyte of data for $40 per month and a $45 fee for each smartphone attached to the plan. From there, the data plans proceed from 4GB to 6GB, 10GB, 15GB to 20GB. 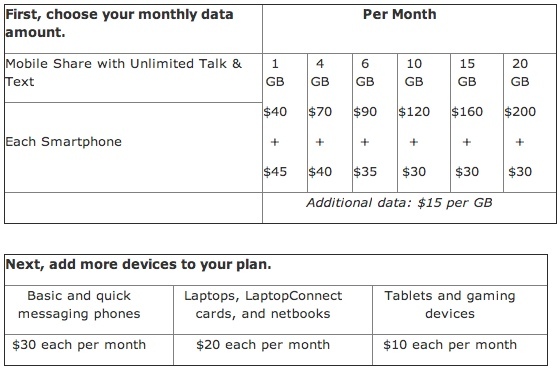 Once you hit the 10GB plan, the smartphone fee drops to $30 per device. Adding a basic phone to any plan costs $30 per month, while a tablet or gaming device costs $10 per month; a laptop, netbook or mobile broadband card costs $20. Verizon, on the other hand, charges $40 per smartphone regardless of the amount of data, with basic phones costing $30 per month, tablets $10 per month and mobile broadband products $20 per month. Plans start at $50 per month for 1GB of data. The next step up is the 2GB option, which costs $60 per month, and then the amount of data and pricing increases by 2GB and $10 per month, with the 20GB for $150. (Interestingly, Verizon doesn’t advertise its data plans above 10GB on its site. I had to do a bit of digging to find them.) Though the per-device fee is more than AT&T’s at the higher data plans, you pay less per gigabyte. As such, a shared data plan between a couple would cost the same amount on AT&T or Verizon, where they share the same data plans. For example, 6GB of data for two smartphones costs $160 per month for both carriers. With the breakdown, AT&T looks like $70 for two smartphones and $90 for the plan; on Verizon, it costs $80 for the two smartphones and $80 for the plan. If you have more than two people in your family, AT&T saves you a bit more money, starting with the 6GB and 10GB plans. A family of four would pay $230 per month for 6GB of data among four smartphones with AT&T, compared to $240 on Verizon. 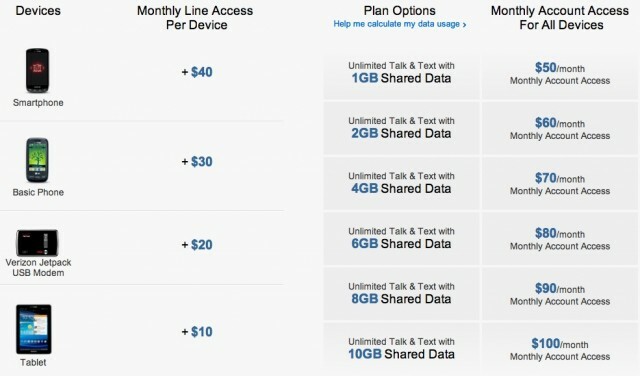 For 10GB, it costs $240 on AT&T and $260 on Verizon. But once you get to the highest tier, 20GB, the result flip-flops, with Verizon being cheaper by $50 per month. With so many variables — the number and type of devices, amount of data — it’s hard to claim one carrier as the clear-cut winner. My advice would be to take the time to calculate the costs yourself, but I will say that I like that AT&T gives you a choice in the matter.